Landing pages are often considered in the context of pay per click advertising. The landing page is where a visitor ends up when they click on your ad. Because you pay for the click, the landing page needs to be optimised for conversion. The landing page mentality also applies to your website as a whole, though. They should really be called action pages, because they can be any page of your site where you hope to capture an action – a subscription, a sale or an enquiry, for example. 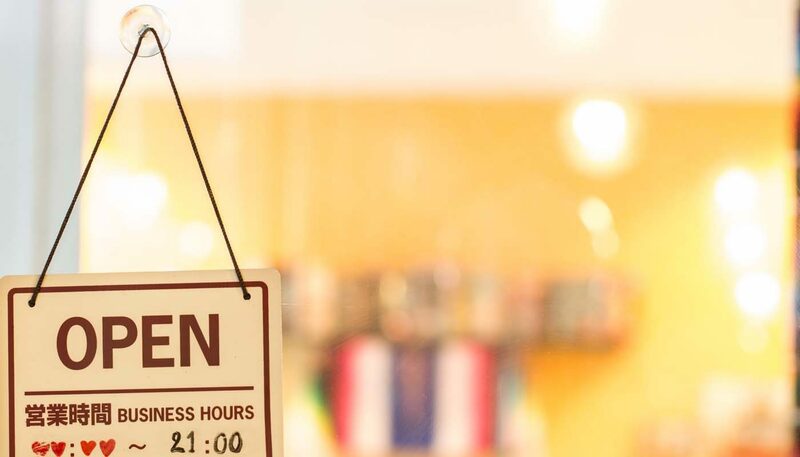 A landing page is the real world equivalent of the entrance to a shop. Customer behaviour will be affected by the presentation of the products, the layout of the store, the atmosphere, the music, choice of colours and many other factors. The difference for websites is that you do not have only one entrance. Customers can arrive at your website from lots of directions and through any one of your pages. The chances are that a lot of your website visitors arrive through news or blog articles. One common problem is that readers will land on the page, read the article, then leave the site. A news article is not a sales page, it’s there to provide information, but that doesn’t mean it can’t lead to a sale. News and feature pages should be designed to minimise bounce rates. A bounce is when someone leaves the site from the same page they landed on, without looking at any other pages. Bounce rates are not great for SEO value, because if Google sees users clicking through to your site and bouncing straight back to Google, that implies your site isn’t very interesting. Also, is it worth investing time and money in creating news and features if it doesn’t get visitors to the pages that matter? Every page of your site should be designed to do one of two things. Either it should convert users on the page or it should entice them towards the pages that do convert. 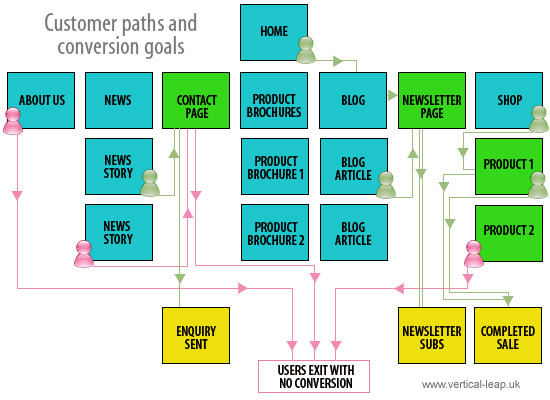 The diagram above is a simple demonstration of the different ways customers may move around your site. The icons are placed on the pages where they arrive, then the lines show where they go. In the case of the reds, they don’t convert. The greens go to the action pages and they complete an action. Looking at your site in this way helps with conversion optimisation because it allows you to identify pages that do not entice users to action pages. When you pay for clicks, you can make people land on the right landing page, but organic search traffic and referral traffic could go to any page. Use Google Analytics to learn how visitors flow through your site. Start by checking the top landing pages and optimise those, then look at which pages Google prioritises in your hierarchy. A quick way to do that is to search for your site using the ‘site:’ operator – eg ‘site:www.mywebsite.co.uk’. Look for high exit rates on important pages. Optimise the design of those pages to try to keep visitors from leaving. Maybe you need a clearer call to action, less clutter or a better offer. If you missed my previous blog about conversion optimisation, you can read it here: What is conversion optimisation?